Roughly the same size as the continental United States, Australia is a boundless and diverse wonderland, with beaches and cities shaping the outer edges and the Outback dominating the interior. The Outback is a living, breathing entity. Many dismiss it as just a desert, which is akin to calling the Rockies just a bunch of hills. Still the Australian Outback is a desert, a home and a journey. It is a canvas painted sunburnt orange-red during days when the heat bends the air, changing to soft purple at night when the skies dazzle with light from the entire universe. The Outback is also a patient collector of awe-inspiring scenery. Through millions of years of evolution and thousands of years of Aboriginal stewardship, the Australian Outback houses a surprising assortment of geological formations and vast woodlands, etched by time, water and sand, and covered with indigenous art and ancient spirituality. For an eye-popping glimpse at the beauty and variety of the Outback, the middle third of Australia creates a unique cross-section. This strip from the northern coast near Darwin to Kangaroo Island in the south is endowed with many reasons to skip Sydney’s manmade marvels for a naturally amazing Australian vacation. Outside of Darwin, the Northern Territory’s tropical capital city, lies Kakadu, Australia’s largest national park. Beyond beautiful, Kakadu encompasses a variety of landscapes, wildlife, and Aboriginal rock art. Believed to be more than 2 billion years old, the land is a jigsaw of flowering wetlands, breathtaking gorges, roaring waterfalls, exotic rainforests and towering sandstone escarpments. 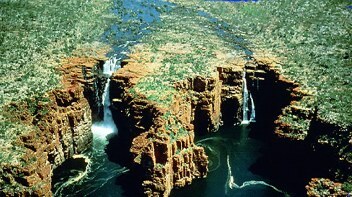 The Kimberley region of Western Australia is one of the world's last great wildernesses. This remote area of rugged ranges with deep, spectacular gorges and unspoiled beaches is the quintessential Australian landscape of red earth, rock, gum trees, crocodiles, wallabies and blue skies. Take a four-wheel drive tour to Wolfe Creek crater—the second largest meteorite crater in the world spanning 850 meters across—or cruise the coastline to Whirlpool Pass, Horizontal Falls and the magnificent King Cascades. 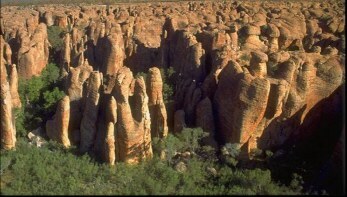 One of the highlights of the Kimberley is the Bungle Bungle Range in Purnululu National Park. A stunning collection of beehive-shaped geological formations arrayed in alternating bands of orange, black and green, the Bungle Bungles were a local secret from the world until discovered in the 1980s. Now thousands flock to behold the wondrous artistry of that sculptor known as Time. Heading south, a magnetic force will draw you to the very heart of the Outback: Uluru. Once known as Ayer’s Rock, Uluru is the largest monolith in the world, holding Australia in place amidst the oceans. Almost 2.2 miles long, the great, moody rock provides the perfect backdrop for the setting sun, spectacularly changing colors from pink to blood red to mauve. The first sight of Uluru will jar your senses. The rock rises mystically out of the cracked red earth, looming like a sleeping giant. From Darwin to Adelaide, this middle slice of Australia provides a scope of natural beauty unseen in any other single country. One way to see it all in just a few days is to take the legendary Ghan train. Travel through vast sheep and cattle stations, ancient mountain ranges and over the red baked earth of the Great Victoria Desert. Marvel at the spectacular scenery in comfort as you’re transported through the heart of the continent. The middle of Australia creates an unparalleled sightseeing tour, yet natural wonders abound from coast to coast. From the Pinnacles in the west, the Blue Mountains outside of Sydney or the Twelve Apostles off the Great Ocean Road in the south, Australia is a country undiscovered, unbelievable and unlike any other. Contact PBTMS WORLD TOURS to discover the natural beauty of Australia. Off the coast of South Australia near Adelaide, Kangaroo Island has a wild, untouched beauty kept safe from overdevelopment. Civilization and wilderness meet in harmony, and sea lions, penguins, dolphins, koalas and kangaroos live in a natural environment. Add a rugged coastline with a sprinkling of secluded bays and magnificent beaches, and Kangaroo Islands is hopping with possibility. 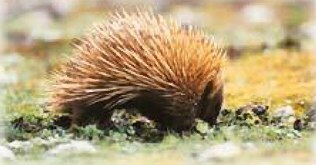 The Kangaroo Island Kangaroo, Tammar Wallaby, Brushtail Possum, Short Beaked Echidna, Southern Brown Bandicoot, Western and Little Pygmy Possum, endemic Sooty Dunnart, Bush and Swamp Rat, six bat species, six frog species, Rosenberg's Sand Goanna, Black Tiger Snake, Pygmy Copperhead, Australian Sea Lion, New Zealand Fur Seal and Australian Fur Seals are all native to Kangaroo Island. The Koala, Platypus and Ring Tail Possum were introduced and still survive here. The Kangaroo Island Kangaroo, a sub-species of the Western Grey Kangaroo is smaller, darker and has longer fur than the mainland species. It shelters in the bush during the day, coming out to graze as dusk approaches. Areas where bush and pasture adjoin make ideal places to observe them. At Flinders Chase National Park, a few extremely docile kangaroos can usually be seen around the Headquarters area, even though feeding is no longer allowed. Little Penguins are found around the coastline, living and breeding in burrows under shrubs, rocks and other sheltered places. On shore at night they call noisily. Guided tours are conducted each evening at Kingscote and Penneshaw. PBTMS World Tour can arrange your special OUTBACK adventure.